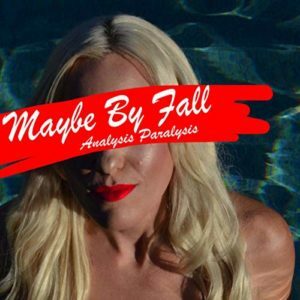 Pretty much led by bendy trashy guitar, the ballsy “Shake Me” starts us off on Maybe By Fall’s new 4-song Analysis Paralysis EP. It’s evident from the beginning here how the band manages round some good time, sing-a-long rock. Singer Rachel Barnard shows another side of her range in the next tune, “Already Gone,” as the band makes its way around an even poppier melody. I like the restraint of the tight arraignment here, things are kept to a commercial rock love song. “Tragedy Called Love” is built around a staccato drumbeat from Tristan Outlaw, and an acoustic guitar, again showcasing Barnard’s lower (and I feel, better) range. This is almost country pop territory which Maybe By Fall handles well, perhaps even better than all the distorted guitar and pop rock stuff. The slight addition of guitar colors (and best leading here), slight occasional echo effects on the vocals, and perfectly placed backing vocals — provided by bassist Peter Riot, drummer Outlaw and the two guitarists, Will Randolph and Paul Taft — really make this one the gems of this EP. The last tune, “One in a Lonely Night,” gets us back to rockin’, with some doubled guitar lines and oh-so-slight punk sensibility to the missing-my-love-song. We get a strong mid-80s-sounding chorus here, but an effective song to be sure. Again the lead guitar shines. Maybe By Fall delivers on Analysis Paralysis. There are some well-written tunes of a certain stripe, the band playing hard and tight behind distinctive vocals (lead and backing) makes for some rather commercial rock concoctions.